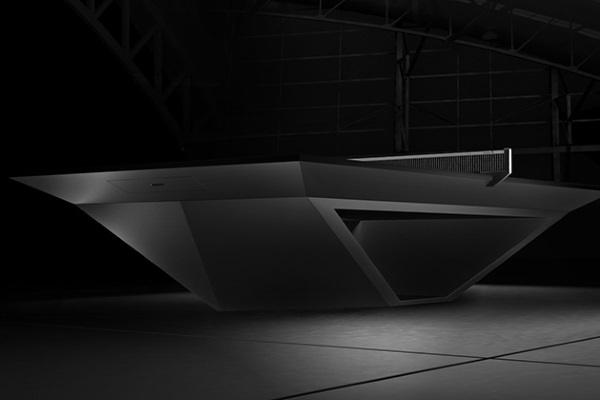 Stealth is a Ping-Pong table designed by Eleven Ravens. Founded in 2011 by a professional table-tennis player, this California business is the first manufacturer of this product that offers made-to-measure projects. Sophisticated design, logo addition and much more: nothing is left to chance when it comes to meeting the buyer’s demands. The artisans do brilliant work; everything is handcrafted. Stealth is truly a high-end product: buyers must invest a sum of $70,000 to get their dream table. Its aviation-like look, which pays tribute to the United States Air Force bomber, will turn each player into a seasoned competitor. The table is made with aluminum and carbon fibres and is offered in five different models. In addition to being made with high-quality materials, the table was designed by Bernard Semerdjian, a world-renowned graphic designer who is one of the founders and creative director at Eleven Ravens.